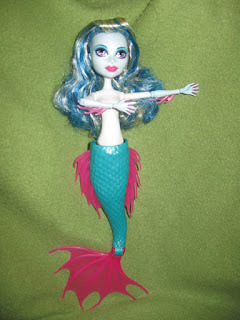 To fill in the terrible gap on this doll between the tail and torso I use 'Milliput, super fine'. I bought mine on Ebay for about $10. 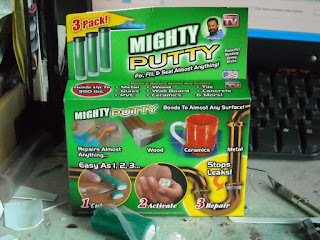 However, I misplaced it and had to use 'Mighty Putty' (sold at Walmart, usually at the front counters in that impulse section), which works the same in a pinch, but does leave little hard bits that will not mix together. You can see them in the photo, they are the dark spots. (you can also use 'plumber's putty', another two part compaound sold in tubes tapes together. I found some at Lowes for only $4. But it will have more bits). It sets up REALLY fast so you have to do it in sections. You can file it down once dry and sand it. Defiantly take an hour to file and sand the sections to get them nice and smooth. Don't be afraid to file into the plastic a little to get a really nice smooth look. I use a needle file set I got at a dollar store, and some automotive sand paper in 1000 and 2000 grit. When the torso is sanded down smooth, tape it off for spray painting, or if using acrylics skip this part. It's good to rub down your plastic with rubbing alcohol to remove any oil and grime left on the doll from your hands. If you don't some of the spray paint may not adhere in spots. This is the spray I used in the photo. It is made for plastic model cars. 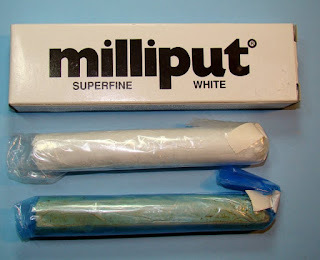 Comes in many colors, and I had it handy. After 2 days it was still not dry. It takes FOREVER to dry, many days, and because of this it will get dust and hair specs stuck to it. You have to let it dry under a cardboard box to keep out the dust. I forgot about the dry time and after a 2 days of waiting I got impatient and striped the paint off and started over with acrylic craft paint. A much better spray to use is a a spray paint meant for vinyl. 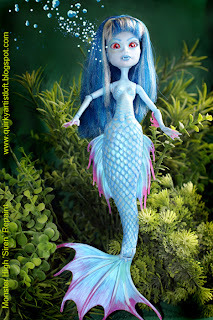 I have used it many times when recoloring a doll white for a ghostly vampire look. 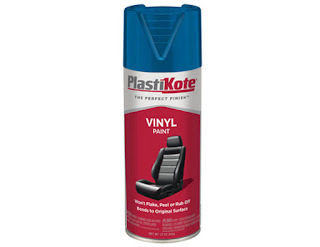 They sell these sprays in the automotive sections at department stores, not the paint isle. 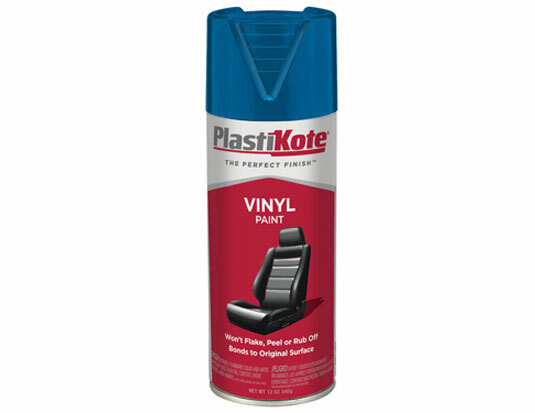 This paint will dry flexible and strong on all plastics and vinyl especially. 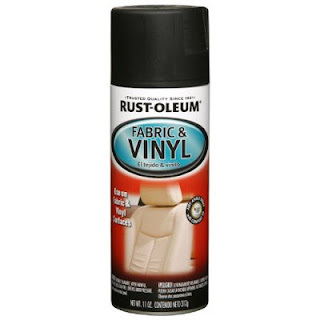 If you use any other type of spray on vinyl it WILL NOT DRY or in time will become very sticky and melt the plastic. 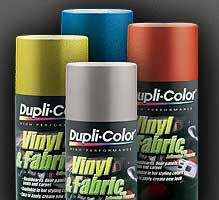 Unfortunately there is a limit to the colors you can get for vinyl spray. 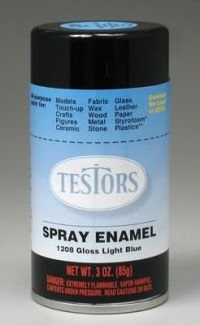 It is made for car interiors so it is usually white, black, tan, and red... sometimes blue. 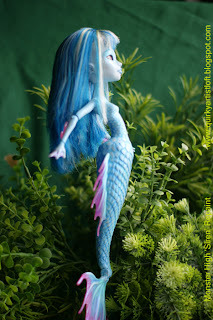 For repainting the doll with acrylic paint I don't have any photos to show you. I used regular acrylic craft paint nothing fancy, just stuff from a dollar store. The real trick is that it must be watered down. 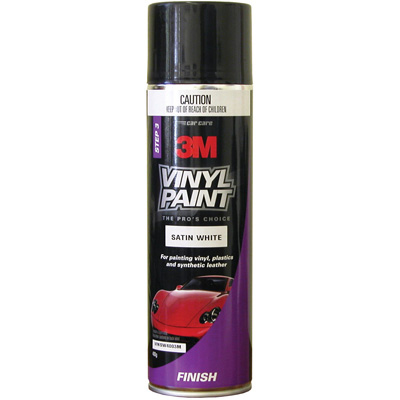 You can use a special thinner that keeps it wet longer, called 'extender', or just keep adding drops of water to the paint. Use this paint like water color paints and do many fine washes. As in, do a wash, let it dry, do any other wash, let it dry. Takes a long time but the results are well worth the trouble. You can get very smooth and perfect, even opaque, or translucent color. The first few washes were of a light blue similar to the head and hand color. After I go the tail to match the skin, I carefully traced around the cracks of the scales with washes of a darker blue. I use this color to paint scalloped scale shapes on the upper body too. 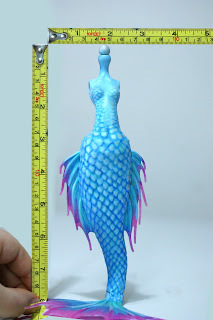 After I this went over the scales with the lighter blue to get a perfect scale shape and fix any mistakes. I also used a wash of light teal green to add a bit of extra color. You can do many types if colors, like a rainbow effect, or gradation. 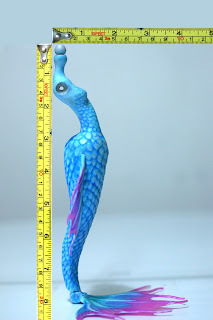 Once dry the paint job was all dry I added a wash of opalescent color to the tops of the scales, and I also created tiny bumpy drops of it at the shoulders and around the eyes. the paint I used was called "Lumiere by Jaquard, Light body Metallic Acrylic, 576 HI LITE BLUE" I got it on ebay and it is meant for fabric, but will work over other paints. For the fangs I actually just used some very thick white paint in the cap of my paint tube and carefully globed a drop on. 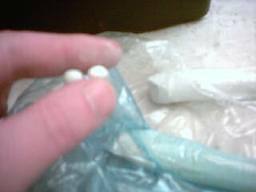 You can also make tiny fangs out of the milliput and super glued them on, but I find they tend to pop off with some light impact. The paint is actually more resilient. After all my painting was done I sealed it with a coat of matte spray. 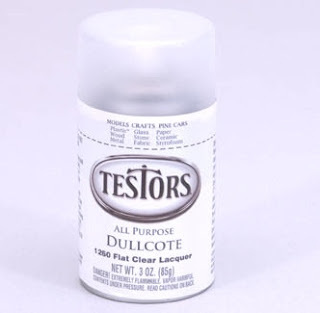 I used 'Testor Dullecote' which is similar to 'Mr. Superclear' sold in japan for model making and what most painters use. It drys in about an hour and gives very similar results for less expense. Here are some shots of the modified torso with the repaint. 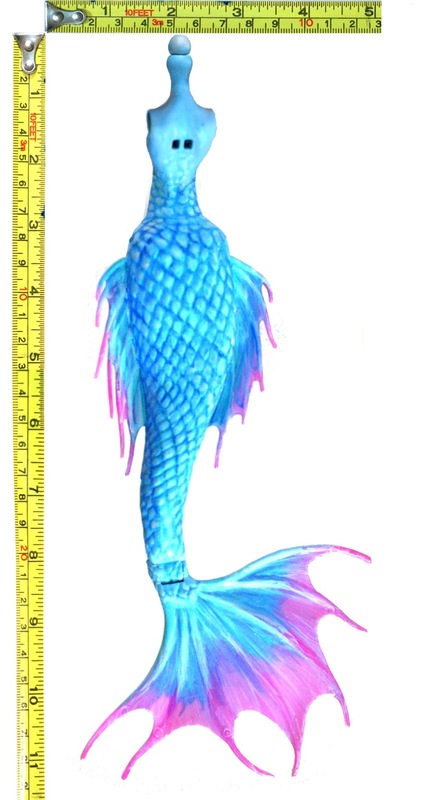 I sized the photos to exact real-life size.I would like to model this torso and tail into a possable ball jointed doll. Here are some shots of the original torso without the modification and original solid color plastic. These is a massive gap that is hidden by a rather ugly belt.